Our wonderful intern and Girls LitClub member, Daija Spaulding, wrote a beautiful, inspiring, and uplifting piece for HuffPost Teen. 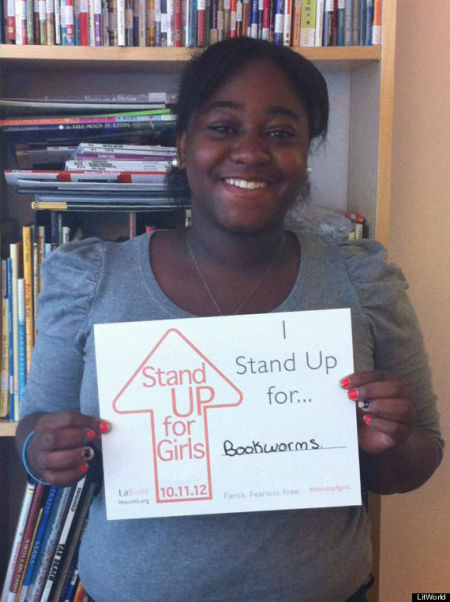 She fearlessly shares her story, and what personally motivates her to Stand Up for Girls. Read the full article here. "I never deviate from the goals I set for myself. I want to be a lawyer and an entrepreneur and a billionaire before I am 24. I want to write a book that will make people cry and laugh at the same time, like Sarah Dessen does. I want to be an inspiration for the little girls who are the bookworms in their schools. I didn't have a childhood like the ones in the movies, but I will be the adult of my dreams. No one will ever make me feel like I am not worthy, because as far as I am concerned I am everything that I need to be right now. It took a long time for me to have that sort of security in myself, but McLean from What Happened to Goodbye shows me how. Just like Madeline from the children's book always taught me, if I stick to my dreams then they should come true, and that's exactly what I plan to do."